U Mumba put up an exhilarating show to completely decimate the Haryana Steelers by a huge 27-point margin and win 53-26 at the Motilal Nehru Sports School in Sonepat, Haryana. Haryana Steelers and U Muma walked into this contest with convincing wins in their previous encounters but the Steelers certainly looked starved of any confidence or push to chase a victory as every attempt to bring down U Mumba went futile. Abhishek Singh, who came into the contest with just 3 points to show from his last two games combined was the unlikely star of the show as he finished with 14 points, while his raiding partners Rohit Baliyan and Siddharth Desai finished with eight points each. 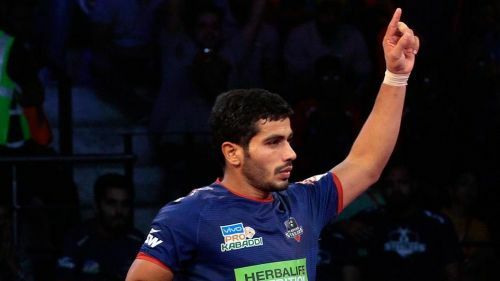 Fazel Athrachali, the chief architect for keeping the Haryana raiders at bay snapped up seven points from this game while young Surender Singh finished with two points. The Steelers were certainly dealt a major body blow with the inefficiency of Monu Goyat on the day, as Vikash Khandola was the only player from the Steelers to show some resistance as he top-scored with nine points. With the massive 53-26 win, U Mumba became the first team to cross fifty points in a game this season while also registering the biggest win in terms of points in this edition of the Pro Kabaddi League. Here are the player ratings from this match. Monu looked a pale shadow of his aggressive self as he failed to get off the blocks regularly, often falling to the corner positions apart from being brought down by Surinder Singh on one occasion. Monu's understudy in the Steelers lineup, Vikash outshined his skipper by a country mile as he finished with nine points and more often than not kept Haryana out of troubled waters. Naveen enjoyed a stellar game against Gujarat but against the might of the U Mumba defense, his nippy raiding went missing. Although he did pick three points from 8 raids, Naveen was not in the best of form. The most experienced defender in the Steelers line-up, Sachin had just the one glorious moment in the game when he initiated a super tackle on Rohit Baliyan in the first half and post that, was not in the scheme of things. The left corner, who asserted his dominance on the right corner in the game against Gujarat had a poor outing as he could just pick a solitary point from five tackles. The youngster was a loophole in the left cover position and was often caught off-guard by the pace generated by the U Mumba raiders on the mat, failing to pick single points from 3 tackles. A right corner position defender's role is imperative and Sunil's contribution to the game went in parallel to the Steelers' overall show as he failed to pick a point from 5 tackles, as matters went from bad to worse for the Steelers. Anand came on as a substitute late in the second half and made life difficult for the U Mumba defenders as he used his pace and guile to good effect, finishing with four points from 7 raids. Prateek served his short span as an all-rounder in the game to an appreciable effect with two points from a total of two raids and two tackles. Parveen defensive abilities hardly came to the fore on the day as he did not pick a single point while on the other hand, he was ushered off the court on two occasions.